For the adjacent railway bridge, see Forth Bridge. For the film, see The Forth Road Bridge. For the second road bridge over the Firth of Forth, see Queensferry Crossing. The Forth Road Bridge is a suspension bridge in east central Scotland. The bridge opened in 1964 and at the time was the largest suspension bridge in the world outside the USA. The bridge spans the Firth of Forth, connecting Edinburgh, at Queensferry, to Fife, at North Queensferry. It replaced a centuries-old ferry service to carry vehicular traffic, cyclists and pedestrians across the Forth; railway crossings are made by the nearby Forth Bridge, opened in 1890. The Scottish Parliament voted to scrap tolls on the bridge from February 2008. By that time, the bridge was carrying traffic considerably in excess of its design capacity, and a parallel replacement was later built. On 5 September 2017, all traffic was transferred to the new Queensferry Crossing. This allowed the Forth Road Bridge to be closed for repairs and also for realignment work on the approach roads to enable its new role as a "public transport corridor"; it was re-opened, for buses, taxis, cyclists and pedestrians only, from 1 February 2018. The bridge can also be used for other traffic in special circumstances, such as roadworks on the Queensferry Crossing, as happened in late November 2017. At its peak, the Forth Road Bridge carried 65,000 vehicles per day. The first crossing at the site of the bridge was established in the 11th century by Margaret, queen consort of King Malcolm III, who founded a ferry service to transport religious pilgrims from Edinburgh to Dunfermline Abbey and St Andrews. Its creation gave rise to the port towns of Queensferry and North Queensferry, which remain to this day; the passenger ferry service continued without interruption for over 800 years. There were proposals as early as the 1740s for a road crossing at the site, although its viability was only considered after the Forth Bridge was built in 1890. The importance of the crossing for vehicular traffic was underpinned when the Great Britain road numbering scheme was drawn up in the 1920s. The planners wished the arterial A9 road to be routed across the Forth here, although the unwillingness to have a ferry crossing as part of this route led to the A90 number being assigned instead. There was more lobbying for a road crossing in the 1920s and 1930s, when the only vehicle crossing was a single passenger and vehicle ferry. Sir William Denny championed the expansion of that service in the 1930s, providing and operating on behalf of the London and North Eastern Railway two additional ferries to supplement the nearby railway bridge. Due to their success, two more ferry boats were added in the 1940s and 1950s, by which time the ferries were making 40,000 crossings annually, carrying 1.5 million passengers and 800,000 vehicles. With the then newest and nearest bridge spanning the Forth (the Kincardine Bridge, built in 1936) still around 15 miles (24 km) upstream, the upsurge in demand for a road crossing between Edinburgh and Fife prompted the UK Government to establish the Forth Road Bridge Joint Board (FRBJB) by Act of Parliament in 1947 to oversee the implementation of a new bridge to replace the ferry service. The authorities on both sides investigated in 1955, and drew up an alternative scheme for a tunnel beneath the estuary. This was known as the Maunsell Scheme, and was projected to run somewhat closer to the rail bridge than the present road bridge. The scheme was abandoned as too ambitious, and a bridge was built instead. The final construction plan was accepted in February 1958 and work began in September of that year. Mott, Hay and Anderson and Freeman Fox and Partners carried out the design work and a joint venture of Sir William Arrol & Co., Cleveland Bridge & Engineering Company and Dorman Long constructed the bridge at a cost of £11.5 million; the total cost of the project including road connections and realignments was £19.5 million. The resident design engineer was John Alexander King Hamilton FRSE (1900–1982). It was the longest steel suspension bridge in Europe. It used 210,000 tons of concrete, with 9 miles (14 kilometres) of grade-separated dual-carriageway approach roads. Reed and Mallik (known for Reema construction of houses) of Salisbury, Wiltshire, built the approach viaducts. Twenty-four individual bridges were built for the approach roads. 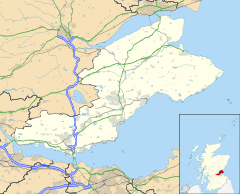 The 4 1⁄2-mile (7.2 km) southern approach road of the A90 began at Cramond Bridge, over the River Almond on the western outskirts of Edinburgh, near Craigiehall. There were two-level interchanges built at Burnshot, Dolphington (B924) and the Echline junction (A904 and B800). At Dalmeny there was a bridge over the railway. The southern approach roads were built by A.M. Carmichael Ltd. The 4 mi (6 km) northern approach road had three two-level junctions at Ferry Toll (for the B980), Admiralty (for Rosyth Dockyard via the A985, and Inverkeithing via the A921) and at Mastertown/Masterton (for what would be the fledgling M90 southern terminus). The Masterton junction was an octopus junction, a variation of a clover-leaf junction, with six bridges and a 600 ft viaduct. There were fifteen bridges built for this approach road. The northern approach road terminated as the A823(M) at a roundabout with the A823 south of Dunfermline, next to Rosyth railway station. The northern approach roads were built by Whatlings Ltd of Glasgow, later bought by Alfred McAlpine. Seven lives were lost during construction before the bridge was opened by Queen Elizabeth II and the Duke of Edinburgh on 4 September 1964. The ferry service was discontinued as of that date. The bridge's management was delegated to the FRBJB, and remained so until 2002 when its operation was transferred to a new body with a wider remit, the Forth Estuary Transport Authority. On 1 December 2010, the bridge was closed for the first time due to heavy snow. After several accidents meant snowploughs were unable to clear the carriageways, the bridge was closed in both directions at 6.40 a.m. and remained closed for several hours. As part of celebrations of the 50th anniversary of the bridge's operation, artist Kate Downie was commissioned to create a print of the bridge and hold an exhibition of works portraying it. On 1 June 2015, Amey took over the maintenance and operating of the bridge on behalf of Transport Scotland from the Forth Estuary Transport Authority and are now called[clarification needed] the Forth Bridges Unit. On 1 February 2018, the bridge became a Public Transport Corridor, with all approach roads in full operation. The bridge was closed between September and mid October 2017 for roadworks before partially reopening for public buses. The bridge's central main span is 1,006 metres (3,301 ft) long, its two side spans are each 408 metres (1,339 ft) long, and the approach viaducts are 257 metres (843 ft) on the north side and 438 metres (1,437 ft) on the south side. The total length is 2,512 metres (8,241 ft). It was the longest suspension bridge span outside the United States and the fourth-longest span in the world at the time of its construction. The bridge is made of 39,000 tonnes of steel and 115,000 cubic metres of concrete. The towers reach 156 metres (512 ft) above mean water level. There is a dual carriageway road with two lanes in each direction, and cycle/footpaths on each side. The main strung cables are 590 millimetres (23 in) in diameter, with 11,618 high tensile wires, each five millimetres in diameter, and each cable carries 13,800 tonnes of the bridge's load. The bridge forms a crucial part of the corridor between south-east and north-east Scotland, linking Edinburgh to Perth, Dundee and Aberdeen by the A90 road and its sister M90 motorway, which begins 1 2⁄3 miles (2.7 km) north of the bridge's northern end. The bridge carried around 2.5 million vehicles in its first year, but this has increased steadily to around 21.4 million vehicles in 2008. The bridge carried its 250 millionth vehicle in 2002. FETA began to be concerned over the structural wear of the bridge in the early years of the 21st century. The planned theoretical capacity for the bridge (30,000 vehicles per day in each direction) was routinely exceeded as traffic levels outstripped predictions. The Scottish Government stated in 2006 that 60,000 vehicles travelled on more than half the days in a year. This raised concerns about the lifespan of the bridge, originally planned at 120 years. In 2003, an inspection programme was launched (costing £1.2 million) to assess the condition of the main suspension cables after corrosion was discovered in a number of older bridges in the United States of a similar design and size. The study was completed two years later and reported that the main cables had suffered an 8%–10% loss of strength. This weakening was projected to accelerate, with traffic restrictions to limit loading required in 2014 in the worst-case scenario, followed by full closure by 2020. An acoustic monitoring system was commissioned in August 2006, using listening devices to monitor any further strands snapping and pinpoint their location within the main cables. In January 2006, the Scottish Executive completed a third-party audit on the bridge which concluded that FETA had performed the initial internal inspection and cable strength calculation in accordance with accepted practice. The report suggested that traffic restrictions could be required by 2013. Several actions were taken to increase the bridge's lifespan. These included a dehumidification programme that slowed the rate of corrosion in the main cables by keeping air in the voids between the main cables' strands below 40% humidity. Engineering consultants Faber Maunsell began work on the project in 2006; it took two and a half years to complete at a cost of £7.8 million. As part of the works, some of the corroded cable strands were spliced. On 23 December, the bridge was reopened for all traffic except heavy goods vehicles (HGVs). On 4 February, it was announced this[clarification needed] had been pushed back to March, due to further problems with the truss end link pins in the southern towers, which required additional remedial work. However, a limited number of HGVs were allowed to cross, in a northbound direction only, between 11 pm and 4 am each night. On 20 February 2016, the bridge was fully reopened. On 20 January, the Scottish Parliament began an inquiry led by the Infrastructure and Capital Investment Committee (ICI) to determine the circumstances that led to the discovery of a cracked truss in the bridge's undercarriage. Evidence was heard from: Forth Estuary Transport Authority (FETA), Transport Minister Derek Mackay, engineers and officials from Amey along with a number of other experts and key personnel. On the first day, Richard Hornby, of engineering consulting firm Arup, stated that the truss end in question had been inspected 23 times since 2001, and no fault had been found. It was revealed that a pin had seized up, which caused the truss end to crack, and was only the quality of the steel which had stopped its cracking appearing earlier. Hornby also made clear that even if the seized pin had been picked up earlier, it was "virtually impossible" to lubricate the bearing. Several witnesses defended a decision by previous operator FETA not to proceed with a £15 million truss end link replacement project in 2010. This was disputed by Barry Colford, former chief engineer and bridgemaster at FETA. Lesley Hinds, FETA's former convener[clarification needed], pointed out that the bridge budget had been cut by 58% in 2011, while senior staff at FETA had "deep concerns" about the transfer of bridge management to a private company. A programme of work is scheduled to take place in 2019 to replace expansion joints in both towers along with replacing the truss end links. [needs update] Plans to replace these joints were postponed by the bridge management following the Scottish Government's commitment to the construction of the Queensferry Crossing; the original work proposals would have involved round-the-clock contraflows during the installation of ramps and mini-bridges to carry traffic over the work area, and heavy lorries being diverted. Initially, it was suggested that tolls would cease once the original cost of construction (plus accrued interest) was repaid. This was achieved in 1993, and it was planned that tolls would not be levied after May 1995. Instead legislation enabling the continued levying of tolls was renewed by Parliament (originally that of the UK but now the Scottish Parliament) in 1998, 2003 and 2006. Originally, a toll was paid for each direction of travel, with sets of toll booths on both carriageways. In 1997, the northbound toll was doubled (from 40p to 80p) and the southbound toll abolished on the presumption that almost all traffic makes a return journey across the bridge, and that the removal of the southbound toll would result in a reduction of congestion without reducing revenue. FETA said the continued charging of tolls was necessary to fund maintenance and improvement works. These included the construction of defences around the submerged piers forming the bases of the main towers to guard against collisions. The main towers were also strengthened with internal steel columns (the original tower structure was hollow) and had hydraulic rams jack up these sections to transfer a portion of the load to the new steelwork. Also, the vertical cables suspending the deck had their bolts replaced after a detected failure. A new paint system required development for the bridge (the original was phased out due to environmental concerns). In late 2005, FETA's committee approved a proposed revamp of the tolls. The minimum toll would stay at £1, but higher tolls would be charged at some times of day, with a maximum of £4 during evening rush hours. All tolls would be halved for cars with more than one occupant, as an incentive to drivers to share cars and make fewer journeys. According to FETA's chairman Lawrence Marshall, the system would provide the most efficiency; he said that 80% of peak-time journeys are made by single-occupant vehicles. The proposal, passed with the chairman's casting vote after the committee was deadlocked, was referred to the Scottish Executive in December 2005, and implementation planned for October 2007 subject to approval by transport minister Tavish Scott. Environmental groups welcomed the proposal, but local politicians condemned it as simply a means of raising capital. At the same time, Fife councillors counter-proposed the complete removal of tolls. The Scottish Parliament debated the proposals in January 2006, and the affair became a major political issue after Westminster MPs Gordon Brown and Alistair Darling (Chancellor of the Exchequer and Secretary of State for Scotland respectively) were seen to describe the variable tolling plan as "dead in the water". Scottish First Minister Jack McConnell insisted his Labour Party colleagues were misquoted, and refused to rule out the plan, receiving criticism from the opposition Scottish National Party. There was a by-election on 9 February 2006 for the Westminster constituency in which the north end of the bridge is situated. It was contested (in addition to the major political parties in Scotland) by an Abolish Forth Bridge Tolls Party. Liberal Democrat candidate Willie Rennie won the election, overturning a large Labour majority on a 16% swing. Afterwards, media speculated that the Executive had turned against the proposals, and Tavish Scott eventually confirmed their rejection and the retention of the existing toll structure on 1 March 2006. FETA condemned the decision, while local opposition MSPs charged the minister that his tolling review short-changed Fifers as tolls were axed on the Erskine Bridge, leaving tolls on only the Forth and Tay Road Bridges. When an SNP minority government was formed after the Scottish parliamentary election of May 2007, a new debate on the abolition of tolls was opened by Transport Minister Stewart Stevenson on 31 May 2007, and the abolition was agreed by a large majority. Annual toll income at that point totalled £16 million. The Abolition of Bridge Tolls (Scotland) Bill was introduced in the Scottish Parliament on 3 September 2007, passed on 20 December 2007, and received royal assent on 24 January 2008. The tolls were removed on 11 February 2008 at 00:01 GMT. This immediately followed a major upgrade and reconfiguration of the tolls on the northbound carriageway (the toll on the southbound carriageway had been removed some years before, simplifying the arrangement as most journeys were, and remain, two-way). From left to right The Queensferry Crossing, the Forth Road Bridge and the Forth Bridge. The strategic transport importance of the road bridge and the threat of closure by 2020 if major structural work were not undertaken led to fears of serious economic consequences. Increasing traffic levels across the Firth of Forth had also led to the construction of the Clackmannanshire Bridge adjacent to the existing Kincardine Bridge. This bridge opened in November 2008. Proposals for a second road crossing at Queensferry had been made in the 1990s, but were shelved, despite preliminary work on route selection. Following the discovery of potentially serious structural issues with the Forth Road Bridge in 2005 the proposals were revisited and plans advanced. The decision to proceed with a replacement bridge was taken at the end of 2007, and it was announced the following year that the existing bridge would be retained as a public transport link. The Forth Crossing Act received Royal Assent in January 2011. Construction began in September 2011. The Queensferry Crossing is a cable-stayed bridge, with an overall length of 1.7 miles (2.7 km). Around 2.5 miles (4.0 km) of new connecting roads were built, including new and upgraded junctions at Ferrytoll in Fife, South Queensferry, and Junction 1a on the M9. The new bridge continues the M90 motorway, (extending its southern terminus) from Admiralty to the M9 junction 1a (re-numbering the M9 spur). The crossing opened on 30 August 2017. ^ a b c d e "Forth Road Bridge Facts and Figures". Forth Bridges Visitors Centre Trust. Retrieved 2 November 2015. ^ a b "FORTH ROAD BRIDGE FACTS & FIGURES". Forth Bridges Visitor Centre Trust. Archived from the original on 17 February 2012. Retrieved 11 December 2013. ^ Forth Crossing Bridge Constructors (consortium). "3 Centuries of Spanning the Forth" (PDF). p. 4. Archived from the original (PDF) on 6 June 2013. Retrieved 19 October 2012. Traffic: Each year, almost 24 million vehicles cross the bridge. Statistics show that, typically, 2% more vehicles head south than north. ^ "Facts and Figures | Forth Road Bridge | The Forth Bridges". www.theforthbridges.org. Retrieved 18 January 2018. ^ "Tolls removed from Scots bridges". 11 February 2008. Retrieved 18 January 2018. ^ "Queen opens new Queensferry Crossing". BBC News. 4 September 2017. Retrieved 18 January 2018. ^ "Forth Road Bridge set to open as 'public transport corridor' tomorrow as Queensferry Crossing becomes motorway". ^ "Queensferry Crossing to be closed to southbound traffic". ^ "Queensferry Crossing closure: Everything you need to know". ^ "Closures lifted on Queensferry Crossing". BBC News. 5 December 2017. ^ "Queensferry History Group Newsletter". Myweb.tiscali.co.uk. 4 November 2004. Retrieved 15 January 2012. ^ "History – Pre 1950". Forth Estuary Transport Authority. Archived from the original on 14 March 2008. Retrieved 7 September 2013. ^ "1922 Road Lists – Roader's Digest: The SABRE Wiki". sabre-roads.org.uk. Retrieved 15 January 2012. ^ "The Withdrawal of the Firth of Forth Paddle Ferries". www.megoran.fsworld.co.uk. September 2004. Archived from the original on 31 May 2010. Retrieved 7 September 2013. ^ "Forth Road Bridge. Burghs Support Committee's Action". The Glasgow Herald. 27 October 1944. p. 3. Retrieved 24 November 2016. ^ Mahmoud, Khaled (14 December 2017). Advances in Cable-Supported Bridges: Selected Papers, 5th International Cable-Supported Bridge Operator's Conference, New York City, 28–29 August, 2006. CRC Press. ISBN 9781351377188. ^ "Work begins on Forth Road Bridge. South Queensferry's Hopes As Tourist Centre". The Herald. 2 September 1958. p. 11. Retrieved 15 May 2017. ^ mtc. "Forth Road Bridge | The Three Bridges". The Three Bridges. Retrieved 18 January 2018. ^ "Ferrytoll Park & Ride". Archived from the original on 25 May 2011. Retrieved 4 December 2015. ^ Pixl8 Developer. "M90. Inverkeithing to Perth and M85. Perth by-pass". Archived from the original on 8 August 2016. Retrieved 4 December 2015. ^ "The Bridge – Introduction". Forth Estuary Transport Authority. Archived from the original on 30 April 2009. Retrieved 7 September 2013. ^ "New transport body for Forth road bridge". Scottish Executive. 17 January 2001. Retrieved 11 December 2013. ^ Auslan Cramb (1 December 2010). "Snow closes Forth Bridge for first time". Telegraph. Retrieved 15 January 2012. ^ "How Kate Downie prepared Road Bridge Diaries". Edinburgh Evening News. 16 August 2014. Retrieved 17 September 2014. ^ "Amey wins contract to operate Forth Road Bridges". The Forth Bridges. Retrieved 18 January 2018. ^ "Forth Road Bridge reopens to public transport". ^ "Bus work 'incomplete' as Forth Road Bridge starts new role". ^ "Public buses back on Forth Road Bridge". BBC News. 13 October 2017. ^ "Traffic Statistics". Forth Estuary Transport Authority. Archived from the original on 16 May 2009. Retrieved 7 September 2013. ^ Mahmoud, Khaled (10 August 2006). Advances in Cable-Supported Bridges: Selected Papers, 5th International Cable-Supported Bridge Operator's Conference, New York City, 28–29 August, 2006. CRC Press. ISBN 9780415419826. ^ Historic Environment Scotland. "Forth Road Bridge with approach ramps and piers (Category A) (LB47778)". Retrieved 26 March 2019. ^ a b "Toll Bridges". Scottish Government. 3 July 2006. Archived from the original on 5 July 2008. Retrieved 7 September 2013. ^ Colford, Barry R; Cocksedge, Charles P E. "Forth Road Bridge – First internal inspection, strength evaluation, acoustic monitoring and dehumidification of the main cables" (PDF). FETA. Archived from the original (PDF) on 18 December 2008. Retrieved 7 September 2013. ^ "Audit of the Main Cable Inspection and Assessment: Final Report". The Scottish Government. 7 March 2006. Retrieved 11 December 2013. ^ "FETA Forges Ahead to Tackle Corrosion". Forth Estuary Transport Authority. 1 December 2006. Archived from the original on 8 June 2013. ^ "Severe corrosion found on Forth Bridge cables". ndtcabin.com. Archived from the original on 11 February 2012. Retrieved 15 January 2012. ^ "Motorists face third day of disruption due to defect on Forth Road Bridge". Herald Scotland. Retrieved 4 December 2015. ^ "Weight restriction on Forth Road Bridge as traffic chaos continues". Dunfermline Press. Retrieved 4 December 2015. ^ Severin Carrell (4 December 2015). "Scotland scrambles for extra trains after Forth Road Bridge closure". the Guardian. Retrieved 4 December 2015. ^ "Forth bridge to be shut until new year". BBC News. 4 December 2015. ^ "Minister explains bridge closure". ^ "HGV trial to start on Forth Road Bridge". ^ "Forth Road Bridge Ready to Reopen to HGVs". ^ Nutt, Kathleen (21 January 2016). "Inspections could not have detected Forth Road Bridge fault, inquiry is told". The National. Retrieved 28 August 2016. ^ "Seized pin caused Forth Road Bridge fault, engineer tells Holyrood inquiry". BBC News. 20 January 2016. ^ "Vital work shelved due to funding cuts, Forth Road Bridge inquiry hears". The Courier. 28 January 2016. Retrieved 28 August 2016. ^ Dalton, Alastair (31 January 2017). "Major roadworks on Forth Road Bridge after Queensferry Crossing opens". The Scotsman. Retrieved 31 January 2017. ^ "Abolition of bridge tolls". The Scottish Government. 30 January 2008. Retrieved 8 March 2013. ^ "National Alliance Against Tolls – Scotland". notolls.org.uk. Retrieved 15 January 2012. ^ "Bridge Projects". Forth Estuary Transport Authority. Archived from the original on 14 August 2009. Retrieved 7 September 2013. ^ "Bridge board backs £4 toll plan". 25 November 2005. Retrieved 18 January 2018. ^ "UK | Scotland | Bridge board backs £4 toll plan". BBC News. 25 November 2005. Retrieved 15 January 2012. ^ "Not even an election can bridge the gap between Gordon and Jack – News". scotsman.com. 29 January 2006. Retrieved 15 January 2012. ^ "UK | Scotland | Minister defiant on bridge issues". BBC News. 26 January 2006. Retrieved 15 January 2012. ^ "Bridge boss furious over decision to freeze tolls – News". scotsman.com. 2 March 2006. Retrieved 15 January 2012. ^ "Bridge tolls 'scrapped by the end of the year' – Politics". scotsman.com. 1 June 2007. Retrieved 15 January 2012. ^ "Date set for bridge tolls to be removed – Politics". scotsman.com. 30 January 2008. Retrieved 15 January 2012. ^ "Time running out for new bridge – News". scotsman.com. 26 January 2006. Retrieved 15 January 2012. ^ "UK | Scotland | Tayside and Central | Name chosen for new Forth bridge". BBC News. 1 October 2008. Retrieved 15 January 2012. ^ "Transport Scotland". www.transport.gov.scot. Retrieved 18 January 2018. Wikimedia Commons has media related to Forth Road Bridge. This page was last edited on 19 April 2019, at 20:13 (UTC).